Dude! It won an award! I just got an email from ebay telling me that it has been 10 years to the day since I signed up for ebay, which I did for the express purpose of purchasing old gaming books from my gaming heyday back in the 80s. Which is to say, it's been 10 years since I took my first steps down the rabbit hole that eventually led to you reading these pixels. But, despite all the crap I've written about on this blog, that first item I picked up on ebay was not a D&D book at all. It was the DragonQuest 2nd edition rulebook. And the first thing I did with it was convert L2 Assassin's Knot to a DQ adventure. Why would I bother doing that? Beats me. Parties were smaller: we never had more than 3 players at a time--partly 'cuz if we could get more together we would just play D&D instead. Also, we only ever ran one character to a player, no henchers or hirelings either. I've always suspected that this was because running a DQ character seemed to absorb more of a player's attention than a D&D one did. Combat was lethal-er: Although the two-tiered hit point system of Endurance and Fatigue--you had to get through one before you started inflicting damage to the other--made it difficult for even low level characters to die from a single blow, it was certainly not impossible. A well-rolled strike could leave you with a messy bleeder, a permanent handicap, or quite dead, while "directly affecting endurance" shots bypassed the 2-tier system--as well as any protective value of your armor--and usually left you stunned or dead as well. Likewise, the monsters were protected by the 2-tier system as well so that even a lightweight kobold-like opponent was probably going to survive at least 2 blows. If you'd already faced a few other opponents that day and run out of fatigue, you were at a serious disadvantage facing off against a fresh enemy of a much lower caliber. It was pretty unlikely that even powerful characters would remain unscathed if combat lasted more than a few rounds (pulses). Whereas Friggird the 10th level D&D fighter encounters a gang of 10 orcs: the DM is probably just gonna hand-wave their demise rather than go through the motions of rolling the dice to see how long it takes to kill 'em all. In DQ, on the other hand, a similarly high level combat-focused character (DQ doesn't have classes in a strict D&D sense) would be a fool to take on that many porkers all by himself: you never know when someone's gonna get lucky and stun you or lay open your aorta. One of my gaming colleagues never quite got this distinction with DQ and kept sending us through full-on D&D-style dungeon crawls. He'd get frustrated when, time after time, we'd open a door and see a gang of lizardmen or whoever and either a) slam the door and runaway, or b) start haggling with them, promising to bring them a family of plump halflings for a snack in exchange for, ya' know, not eating us. Even after several TPKs at his hand, he still didn't understand that the DQ combat rules just didn't support the hack n' slash motif he was going for. PCs were bigger: This is a matter of personal perspective, but while I tend to envision my D&D characters as being about the size of the miniatures on the table, DQ characters I think of as being much closer to life-sized. And covered with scars. I think the fragility of these characters made them loom larger in my imagination than most of my D&D characters did. 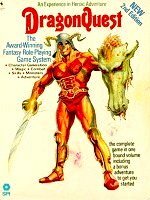 No Magic items: Magic items were not standard in DQ--I don't believe they were even mentioned in the rulebook--and, as such, they were pretty much non-existent in the game. I remember one gang of characters we had spent their entire careers on a quest to find some legendary magic sword. I think the appeal for us as players was that this was a chance to find out how a magic sword would manifest itself in DQ; as of yet we had never seen one. For that reason we were exceptionally distraught when we finally found the sword, only to have it stolen from our grasp--a la Belloq in "Raiders of the Lost Ark"--by the little old man that we had foolishly believed to be a benevolent sage. Seriously, we spent the better part of a year hunting down this sword from person to person, dungeon to dungeon, but never did figure out what was magical about it. Goddamn Macguffin.